In 17th and 18th Century France, there were an extraordinary number of men and women artists that emerged, making a name for themselves. They were poets, fabulists, painters, playwrights, actors, composers and writers. Some of the writers became the foundation for the L’Académie Française, which was established in 1635 by Cardinal Richelieu, the chief minister to King Louis XIII. The Académie is the most distinguished learned body on matters pertaining to the French language. The Freelance History Writer would like to take a look at some of these remarkable artists. 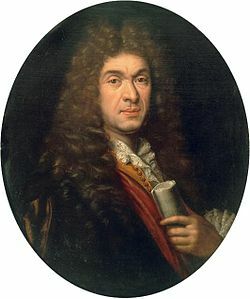 Jean-Baptiste de Lully was an Italian-born French composer who spent most of his life working at the court of King Louis XIV. Lully is considered the chief master of the French baroque style of music. He became a French subject in 1661. Giovanni Battista Lulli was born on November 28, 1632 in Florence, Grand Duchy of Tuscany. He had little formal education but learned guitar from a Franciscan friar and also learned to play the violin. In 1646 he was discovered by Roger de Lorraine, son of Charles, Duke of Guise and taken to France where he worked in the household of Roger de Lorraine’s niece, Mademoiselle de Montpensier. He came to King Louis XIV’s attention, dancing with him in 1653. That same year Lully was working as royal composer of instrumental music, composing ballets and by 1661 he was appointed Superintendent of the Music of the Chamber of the King. After he naturalized, he married the daughter of a singer and renamed himself Jean-Baptiste de Lully. He composed many ballets in the 1650’s and 1660’s in which the King and Lully danced together. In 1661, Lully met the French playwright and actor Moliére, they began working together and created the comédie-ballet. When the King could no longer dance, Lully began writing operas. He created a position for himself which essentially gave him complete control of all music performed in France until his death. In March of 1687, Lully was conducting a Te Deum in celebration of King Louis’ recovery from surgery and struck his toe with his conducting staff. The toe became gangrenous and he died on March 22. King Louis XIV always thought of Lully as a true friend. Truly loved that J-B de Lully reinvented himself. What a great talent – the music is fabulous!! Another early death of a composer, too.